In our latest beta release of ExamDiff Pro 3.5, the biggest change is the addition of many new features concerning plug-ins. In this blog post, I will go over four new plug-in features. The biggest, and most noticeable, of these is the option to install 10 plug-ins automatically. 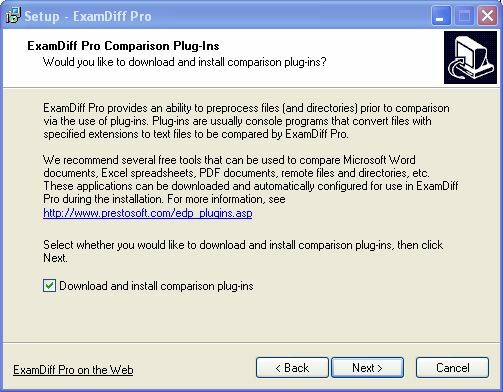 When you install ExamDiff Pro, at one point you will come to a message box asking your permission to install plug-ins, as shown below; if you say yes, ten of the most important plug-ins available (see our list of ExamDiff Pro plugins) will automatically be downloaded and installed. Neat! Note: All of the plug-ins that are installed with ExamDiff Pro are free to use, and some are open-source; we provide the source code for those plug-ins whose license (most notably, GPL) requires it. Two more improvements are the ability to compare archives (i.e. ZIP files) with directories, and the ability to specify default remote file and directory plug-ins (these are set by default if you choose to automatically install plug-ins). Now, whenever ExamDiff Pro sees that you are trying to compare a remote (i.e. HTTP or FTP) file or directory, it will automatically use the appropriate default remote plug-in. The Compare dialog screenshot below shows both of these features in action. Last, but not least, you are now given the option to cancel a plug-in in operation: the following dialog is displayed whenever a plug-in takes longer than a second to complete its task. 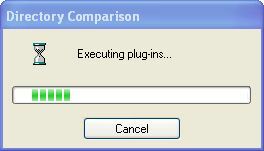 Clicking Cancel will stop the plug-in immediately and attempt to compare the files or directories without plug-ins. This comes in handy when a plug-in takes a long time, and you decide to stop comparison.